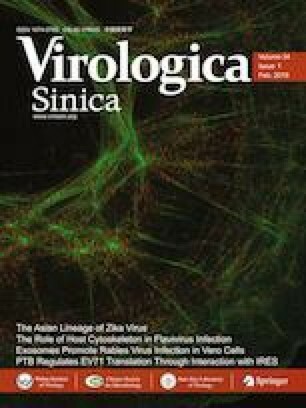 Interferon, a natural protein that is produced by a variety of cells during viral infection, activates the transcription of multiple functional genes in cells, regulates synergy among various signaling pathways, and mediates many biological functions such as antiviral activity, immune regulation, and cell growth. However, clinical research on interferon in livestock is lacking. In this study, recombinant porcine interferon (PoIFNα) was used as an adjuvant, in combination with inactivated influenza virus, to vaccinate 6-week-old pigs via nasal infusion. The transcription of target genes was then monitored and the functions of PoIFNα were determined with respect to the activation of mucosal immunity. We found that a combination of low-dose PoIFNα and inactivated influenza virus could significantly up-regulate the expression of immunoregulatory cytokines such as IL-2, IL-18, IFN-γ, IL-6, and IL-10 by real-time PCR, suggesting the induction of a strong mucosal innate immune response after administration. In addition, low-dose PoIFNα can significant enhancing the transcription of genes encoding homing factors including CCR9 and CCR10 (P < 0.001), thereby resulting in the induction of higher levels of HA-specific antibodies (P < 0.05), which can be determined by ELISA and IFA. Post-immunization challenges with H1N1 virus demonstrated that PoIFNα, combined with inactivated influenza virus, could alleviate clinical signs in pigs during the early stages of viral infection. These studies reveal low-dose PoIFNα as a potential mucosal adjuvant for influenza virus in pigs. The online version of this article ( https://doi.org/10.1007/s12250-019-00102-7) contains supplementary material, which is available to authorized users. We gratefully acknowledge the workers of Beijing Sinder Technology Co., Ltd. for their help with pig immunization and sample collection. This work was supported by Grants from the National Key R&D Programme of China (2017YFD051105), the National Natural Science Foundation of China (31630079), the National Science and Technology Major Project (2018ZX10101004), and the Strategic Priority Research Program of the Chinese Academy of Sciences (XDB29010000). W.J.L. is the principal investigator of the Innovative Research Group of the National Natural Science Foundation of China (Grant No. 81621091). J.L. is supported by Youth Innovation Promotion Association of CAS (2019). JL and WL supervised the Project and designed the study; JL and LL planned and conducted the experimental work, analyzed the data, and wrote the manuscript; WF, HZ, SZ, LC, MW, XB, WY, LY, and LS provided technical support. All authors read and approved the final manuscript. The pig experimental design and protocols used in this study were approved by the Institute of Microbiology, Chinese Academy of Sciences of Research Ethics Committee (Permit Number: PZIMCAS2017001). All pig experimental procedures were performed in accordance with the Regulations for the Administration of Affairs Concerning Experimental Animals approved by the State Council of People’s Republic of China.